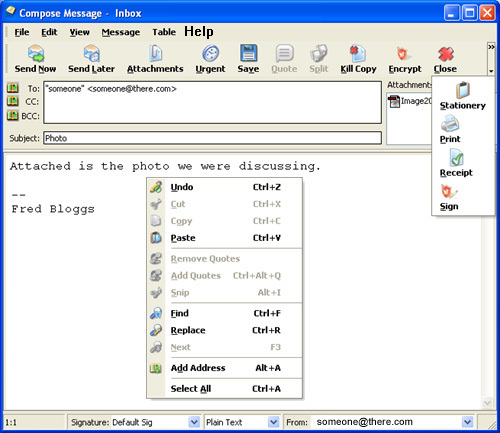 Under the Editing settings an overall decision can be made to use Plain Text or HTML for composing messages, but individual folders can be also set to use different formats. 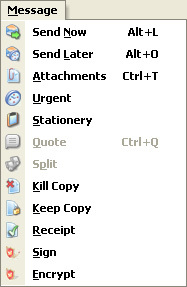 The Plain Text Editor works in a similar way to the HTML Editor, but with no more than very basic layout options. It is possible to switch between Plain Text and HTML format whilst composing a message but be cautious as moving from HTML format will lose all of your formatting, though the content and basic structure of the message will be preserved. Please click a HotSpot on the image below for further information. This is different to that in the Main Window as different functions are available here. Click on a hotspot on the image below for further information.